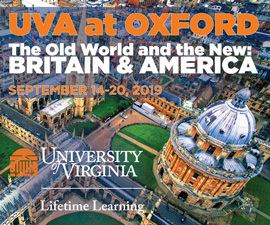 The University of Virginia Cemetery from UVA Magazine on Vimeo. Its wonder is realized in the embracing stillness one senses within moments of entering the University of Virginia Cemetery. The nearby commotion of traffic and student life is somehow held at bay, present yet subdued. During the last 180 years, this place of eternal repose has heard the keen of grief and has been touched by countless tears. Yet within its quietude it seems not a space of sadness, but one of reflection. In this stone-bordered field, one can ponder lives of exceptional accomplishment and perhaps recall memories of departed friends and loved ones. And what stories it offers. Flanked by Alderman and McCormick roads, this place of rest and solitude wasn’t initially intended for the purpose it came to serve. On May 9, 1825, the University’s first proctor, Arthur S. Brockenbrough, paid John M. Perry $6,600.93 for 153 acres of land between the Rotunda and Observatory Hill. The Board of Visitors agreed to the steep price because they saw no recourse. Pipes that carried water from the nearby reservoir to the school were buried on the property, and it was imperative to control access to such a vital resource. Three years after the land deed changed hands, a typhoid epidemic swept through Charlottesville. One of the first victims of the scourge was Henry William Tucker, younger brother of professor George Tucker, who taught moral philosophy at the University. The physician was buried near what would become the west wall of the old cemetery. It wasn’t long before pick and spade were again at work. John Temple, a student from King and Queen County, also contracted the deadly disease. After days of wracking pain and a scorching fever, he died on July 19, 1828. Within hours of Temple’s passing, downcast students and professors crowded into the Rotunda to pay their respects. During the memorial service, the students agreed to wear black crepe on their left arms for 30 days as a symbol of honor and remembrance of their friend. Soon the graves of other students such as Henry Townsend Conway and Laban J. Hoyle extended the row of headstones farther. Thomas Jefferson had made no specific plans for a cemetery at the University, but disease had made one necessary by 1828. Occasionally, misadventure added victims as well. In 1897, Col. C. C. Wertenbaker, son of the University’s first librarian, William Wertenbaker, mentions the tragic demise of John A. Glover in a letter. The correspondence was written in reply to a query from Professor J. A. Harrison concerning the early history of the cemetery. Glover was a popular student who died on April 11, 1846, as a result of a blow to the head he suffered two days prior. The tragic incident occurred while he and friends were attending a circus that had come to town. One of the most dangerous acts involved a lion that would pull a cart with an animal trainer riding inside it. During the performance, Glover foolishly tossed a burning cigar into the arena, spooking the cat and causing an uproar. In a moment of blind rage, the infuriated trainer picked a large tent peg off the ground and struck the student with it. The assailant fled town, leaving the circus owner to face the consequences. According to Wertenbaker, the man he described as “the elephant keeper” was tried for murder, but acquitted. Wertenbaker also described bodies being buried and removed, hinting at the practice of grave robbing, which was common during the early years of the cemetery. Because laws at the time made it illegal to dissect or possess a human body, a black market arose to supply cadavers to medical schools for gross anatomy studies. Particularly susceptible were bodies of University servants buried on the north side of the cemetery. When grave robbing became almost routine at the cemetery, family members started holding mock daylight funerals to foil the ghouls. They would bury a log or bundle of rocks wrapped in a shroud for all to see. Later, during the night they would return to bury the body in secret. For the most part, grave robbing ended when Virginia and other states passed laws allowing medical schools to obtain corpses for study and dissection legally. When the last ground plots in the University of Virginia Cemetery were sold in 1966, that didn’t end the demand. Leigh B. Middleditch Jr. (Col ’51, Law ’57) was instrumental in finding a solution to the problem. For years, he and other alumni worked toward the creation of a columbarium at the cemetery. In 1987, the Board of Visitors approved the establishment of the wall and its eligibility criteria, and the University became one of the first institutions of higher education to build a columbarium. During the next several years, two memorial walls, each containing 180 vaults, were created. The first wall, finished in 1991, is sold out. The second wall, completed in 2003, is about a quarter full. In general, the vaults are available to faculty, active and former members of the Board of Visitors and alumni as determined by the Alumni Association’s Board of Managers. Friends of the University might be accepted on a case-by-case basis. Dearing Johns, an associate professor of medicine who chairs the cemetery committee, says a master plan allows for the development of other vaults, and if current trends continue, further expansion might not be far in the future. Johns believes love of one’s alma mater, as well as shifting cultural dynamics, motivate professors and alumni to choose their university as their final resting place. “I believe if a university has meant a great deal to a person, it takes on a feeling of home,” says Johns. For the first several decades of its existence, the cemetery grew at a pace regulated by the normal ebb and flow of life. This changed dramatically during the Civil War, when the scythe of war was loosed to do its violent reaping. Charlottesville and the University were quickly turned into a major hospital area. Before long the cemetery had the appearance of a freshly tilled garden, as grave diggers worked feverishly to stay apace of the need. 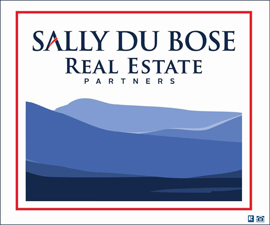 As nearby battles such as First and Second Bull Run, Cross Keys, Port Republic and Cedar Mountain added to the carnage, a perpetual moan of death and suffering hovered over the blood-stained Grounds. 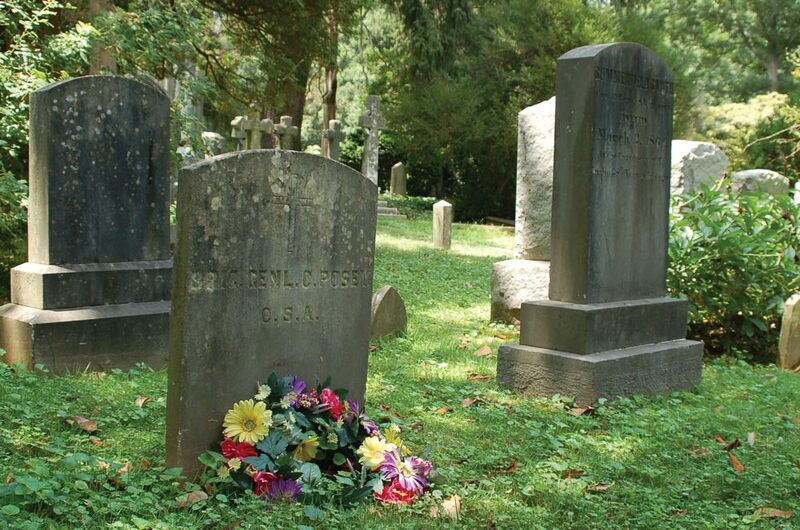 By war’s end, 1,097 graves held the remains of soldiers, including two Confederate generals—Turner Ashby and Carnot Posey. In 1866, a group of Charlottesville women, most of whom had cared for sick and wounded soldiers during the war, started the Ladies Confederate Memorial Association. Week after week they copied from hospital registers the names, states, companies and regiments of those who had died. The women transferred the information onto rough wood markers that were placed at the head of each grave. They also collected $1,500, used to build a stone wall around the Confederate Cemetery. The following years were bleak times for many Southerners, and what little money people had went for the necessities of life. By 1890, the cemetery had largely gone to seed, and the wooden headboards had crumbled with decay. Distressed by the unsightly condition of the cemetery, the ladies association spearheaded a three-year reclamation effort. The project involved removing rotted grave markers, rerecording names and grave locations and replacing brush and bramble with a lawn of grass. Money for the restoration was raised in various ways, including music concerts and the sale of cream-covered strawberries to students. On June 7, 1893, the effort reached its zenith when the towering statue of a Confederate soldier was unveiled at the cemetery. In 1905, the Society for the Continual Care of the Cemetery of the University of Virginia was established to ensure it would never again be allowed to degenerate into the overgrown entanglement it had once become. The cemetery was also extended, and in 1938 it was enlarged for the third and final time. The march of other tired feet continued, as well as the patter of paws. Within a month of Dabney’s passing, another red mound of freshly turned Virginia soil appeared just beyond the cemetery walls. The small grave was dug for the University’s first mascot, a black-and-white dog of unknown ancestry who possessed the heart and bearing of a king. The pooch who became the “canine lord of UVA.” appeared one day on the front porch of the Beta Theta Pi fraternity house. The beer-and-hamburger-loving dog became widely known in 1938 after he was the subject of admiration on the nationally broadcast radio program, Pontiac Broadcast. Look magazine further advanced his fame by publishing a picture of his handsome mug. The beloved dog died on April 6, 1939, a day after he was hit by a car on Rugby Road. Owen took on the sad task of making the coffin. An estimated 1,000 people attended the funeral. Dean Ivey Lewis gave the eulogy at the flower-covered gravesite. “There are many one-man dogs and many one-family dogs, but Beta was a whole university’s dog,” Lewis said. Against all odds, the University was blessed by yet another canine mascot that became as dearly loved as his predecessor. Like Beta, Seal just showed up one day in the early 1940s and decided to stick around. Named for his sleek black coat, the “Great Seal of Virginia” was welcome in all classrooms and local establishments. After giving a particularly famous performance on a fall afternoon in 1949, he earned the weighty title Caninus Megaphonus Pennsylvanus. Seal, proudly wearing his blue blanket embossed with a large orange “V,” had traveled with the football team to Franklin Field in Philadelphia to play the University of Pennsylvania. At one point during the game, he demonstrated his disdain for the opposition by crossing the field and relieving himself on a Pennsylvania cheerleader’s megaphone. For nearly two centuries, the tree-shaded cemetery has served as the final resting place for great educators such as William Holmes McGuffey, whose Eclectic Readers during the 19th century sold second only to the Bible; Henry Bearden Mulholland, a distinguished figure in American medicine; and world-renowned physicist Jesse Wakefield Beams. Four of the University’s presidents also lie here. Only Beta and Seal have earned a resting place nearby. Since 1905, burial in the cemetery had been restricted to members of families already using plots in the cemetery, students in attendance at the University and members of the families of the faculty and officers of the University. In 1942, it was decided that only full-time officials of the school could be interred there because so little room remained. 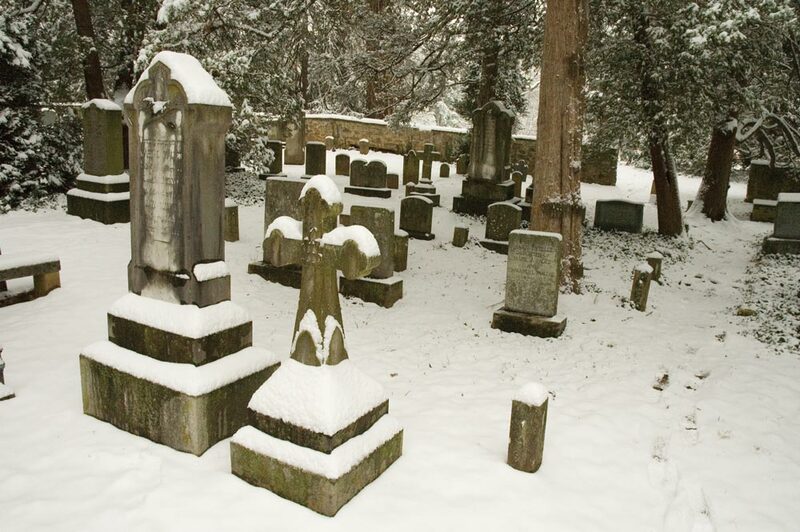 The last cemetery plots were purchased by professor Edward Younger and his wife in 1966. Ground burials in the cemetery are now infrequent, but in 1999 one of the University’s most devoted and loved educators was laid to rest there. Professor Joseph L. Vaughan taught at the school for more than a half century and helped create the engineering school’s humanities division. On an autumn day in 1991, Vaughan strolled the Grounds he loved so much. He spoke of friends, many of whose remains were in the nearby cemetery. But mostly he spoke of the students who were such an important part of his life. Before heading home that day, the aged professor paused in front of the Rotunda. For a long moment he looked about, before speaking words that could have served as his epitaph. “Every student I’ve ever taught was important to me,” Vaughan said as he held a copy of his just-published book, Rotunda Tales, in his hand. “I never taught a student I didn’t like, and it was a personal responsibility and engagement for me to help this young lady or young man flower in their own terms. Like many arriving first-year students, Ted Delaney surveyed the University of Virginia with wide-eyed trepidation. As he entered the somewhat choreographed chaos of Webb Dorm, he yearned for a quiet place he could escape to. He soon discovered it was right across the street. “The cemetery was one of the first quiet spots on Grounds that I discovered when I was at UVA,” Delaney says. “I came to love that place. On afternoons when it was nice outside, it was such a peaceful spot to walk through. A few days after graduating in 2000 with a degree in anthropology, Delaney went to work as the archivist and curator of Lynchburg’s Old City Cemetery. 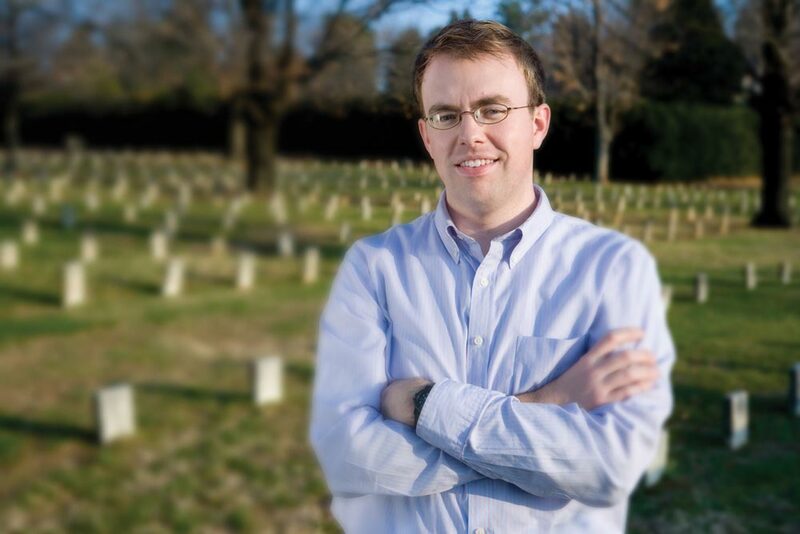 He credits the UVA Cemetery and late professor James Deetz for helping fuel his fascination with cemeteries. “In his field of anthropology and archaeology, Professor Deetz was a real revolutionary in terms of how people think of cemeteries,” Delaney says. “I got interested in his perspective and the way he looked at cemeteries and how he studied stones. Delaney believes cemeteries no longer have the negative, morbid connotation they once did. He says that people are often drawn to the Old City Cemetery for the same reasons he was drawn to the UVA Cemetery when he was a student. “Old cemeteries can be like an oasis in the increasingly chaotic places where we live and work,” Delaney says. 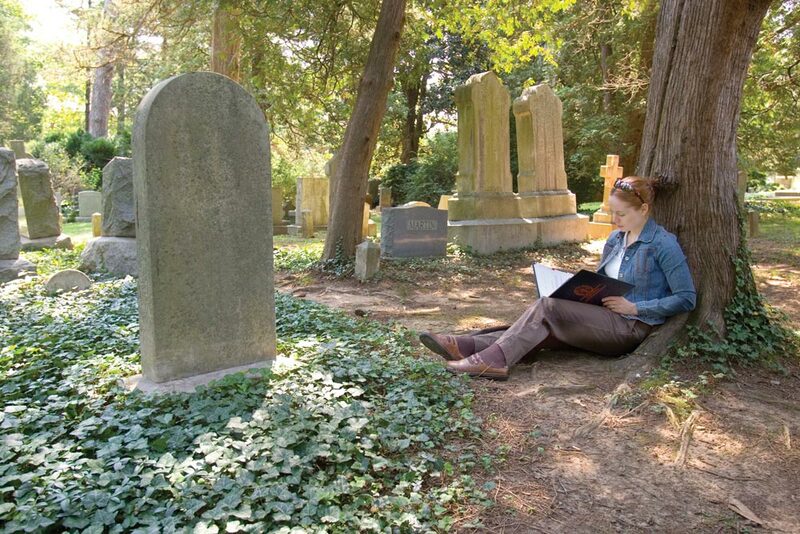 “When you walk into the quiet of the UVA Cemetery, you absolutely do feel that you’re stepping into another zone or place. It’s almost ironic when you think about it, because when that cemetery was first conceived and laid out, it was meant to be out in the country. It was meant to be a place away from where people lived and worked. When you mention “servants” whose bodies were being stolen from their corner of the cemetary does this actually mean slaves? Or were African Americans not buried here?